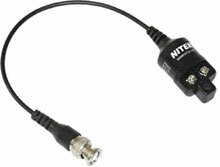 Nitek VB31PT Video Balun Transceiver - 9" Pigtail with Male BNC Connector, up to 500 feet (152 meters) with Passive Transceivers. The VB31PT Video Balun Transceiver, designed for Twisted Pair transmits up to 500 feet (152 meters) with Passive Transceivers and up to 3,000 feet (914 meters) with Active Receivers. The VB31PT Video Balun Transceiver is designed to provide superior immunity from noise and interference even when running next to line power. These units are intended for use over existing in-house telephone wiring, Category 5 wiring or other twisted pair cable runs to provide a convenient, cost effective alternative to coax. VB31PT Video Balun Transceiver is compatible with all twisted pair equipped cameras, enclosures and domes. The Nitek VB31PT is also known as NTK-VB31PT	.